If you are puzzled by where to look to change the iPad's settings, you aren't alone. We are used to settings being a special menu item, but the iPad doesn't have a menu. It has apps. And that's exactly what the iPad's settings are: an app. The app is gray and looks like gears turning, but there are easier ways to open Settings than hunting through screen after screen of app icons until you finally locate it. The absolute fastest way to open Settings on your iPad is to ask it. Hold down the Home Button to activate Siri, and once the voice assistant is activated, simply say, "Launch Settings." 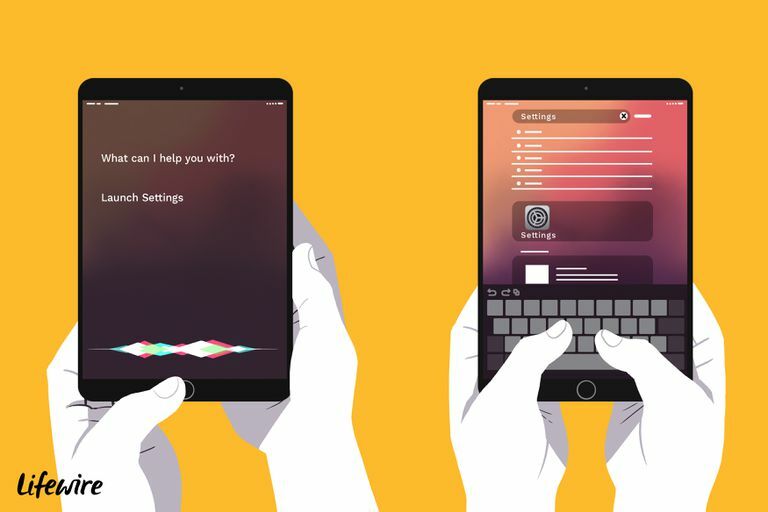 Siri is an absolutely wonderful tool and launching apps by name is just one of many productive features Siri can offer. But what if you don't like talking to your iPad? You don't need to strike up a conversation with a machine to quickly launch Settings (or any other app for that matter). The iPad has a universal search feature called 'Spotlight Search' that is available with the flick of a finger. Simply place your finger down on any empty part of the Home Screen, which is the screen with all of the icons, and then move your finger downwards without lifting it from the display. The search screen will appear and you can type "settings" into the input box to reveal the Settings app icon. At that point, you can just tap the icon just as you would on the Home Screen. Quick Tip: If you are the type that constantly likes to tweak settings, you can move the Settings icon to the dock at the bottom of the iPad's screen. This is a great way to always have quick, easy access to it. What Can You Do in the iPad's Settings? There are a number of great tweaks you can make in the settings screen that will change how your iPad behaves. Some of these are very useful, like turning off cellular service to save battery life, and some are very important for those who need extra help using the iPad, like the accessibility settings. Add a new Mail account. Easily the most popular reason to go into your iPad's settings, you can add new mail accounts under the Mail, Contacts, Calendars settings. You can also configure whether or not the mail should be pushed to your iPad and how often the mail is fetched. Turn off notifications for a specific app. Sometimes, an app can get a little hyperactive in sending you notifications, so rather than turn off push notifications for the entire iPad, you can go to the Notifications settings and turn them on or off for an individual app. Adjust the iPad's brightness. This is a great tip for saving battery life. In the Brightness and Wallpaper settings, simply slide the brightness down to a point where the iPad is still easy to see but not quite as bright. The lower this setting, the longer your battery will end up lasting. Jump Ship from Google. You don't have to use Google as your default search engine. Under the Safari settings, you can configure the default search engine to be Google, Yahoo or Bing. Turn on automatic downloads. A neat feature of Apple's move towards the cloud is the ability for the iPad to automatically download music, books, and apps made on other devices, including purchases made on your PC. Customize your iPad's Look. You can use any image you want for the background on the lock screen and on the home screen by setting a custom wallpaper. Configure Touch ID. If you have a newer iPad with the Touch ID fingerprint sensor and you didn't configure it up during the initial setup, you can do so in settings. Remember, Touch ID isn't just for Apple Pay. It has many other uses such as quickly unlocking your iPad without typing in a passcode. Change the iPad's sound settings. If you use the iPad as a music player, you can change the EQ settings on the iPod application to better represent the type of music you are playing. This setting defaults to acoustic, but it can be changed to anything from classical to hip-hop to a bass booster. Configure FaceTime. Want to change how you are reached at FaceTime on your iPad? You can turn FaceTime on or off or even add another email address to the list. Stop being bugged by Wi-Fi. iOS's ability to ask you whether or not you want to join a nearby Wi-Fi network can be handy at times, but if you are traveling in a car and passing by different networks, it can also be quite annoying. In the Wi-Fi settings, you can tell the iPad not to ask you to join nearby networks.